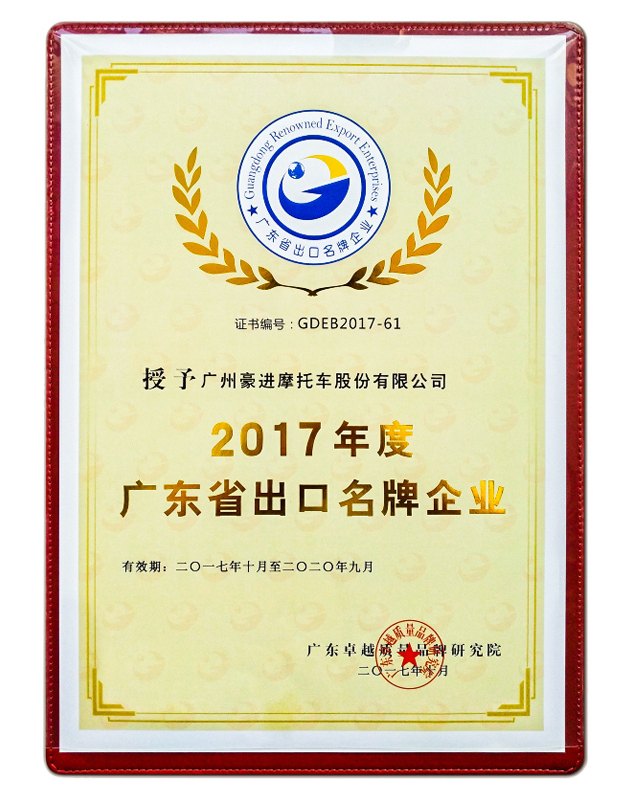 In October 2017, by the guidance of the department of commerce of Guangdong province and Guangdong excellent quality brand research institute sponsored “2017 Guangdong Renowned Export Enterprises” officially announced the results that Haojin was awarded of this honor title. The evaluation of “Guangdong Renowned Export Enterprises” is approved by Guangdong provincial department of commerce. It is organized by the excellent quality brand of Guangdong institute ,soliciting opinions from all sides fully on the basis of the export enterprise information collection while organisers from more than 20 experts from different industries evaluate these enterprises in accordance with <Guangdong Renowned Export Enterprises index system and grading standards> then finally selects the awarded winners. As the forefront brand of Chinese motorcycle, Haojin promotes technology innovation, controls quality strictly and enhances brand image year by year, which makes it become customers’ favorite products. Haojin was awarded the honorary title “2017 Guangdong Renowned Export Enterprises” at this time. It is also the best demonstration of affirmation from global users for Haojin product quality.